The Decline of America offers a carefully documented analysis of the last seventeen U.S. presidents. These men, eight Democrats and nine Republicans, have shaped the last 100 years, not only for America, but for the world. Each president is profiled with unsparing scrutiny so we can see where it’s all gone wrong. David Schein follows these critiques by proposing ways to improve America’s outlook for the next 100 years—before it’s too late. "This is a book for all ages. It covers a breathtaking swath of American history in a way that should interest young adults and mature readers. In today's hyper-partisan environment, it was wonderful to read an objective, fact-based narrative of American presidential history. It is destined to become a veritable "go to" source to learn about U.S. presidents." "David Schein has articulated the concerns that many Americans have been thinking for many years, especially since the 2006 presidential election. That is, the United States has been in a sharp and grave decline from its world leadership role for the better part of 50 to 100 years. In The Decline of America, Schein offers an in-depth evaluation of every American president for the last 100 years and gives them each a grade, most of which are barely passing. In doing so, he uncovers underlying themes that have contributed to the decline we are now experiencing. He also provides a prescription for returning the country to its rightful world leadership role, which includes asking Americans to better educate themselves on the issues, not as the pundits, political consultants, and candidates spin them, but based on their own objective and non-partisan research and experience. Reading Dr. Schein's book is a huge first step in that process." "While The Decline of America offers a historical perspective of the presidency and the men who have occupied it for the last century, it also serves as a precursor to what we might expect from Oval Office inhabitants in years and generations to come. Schein's look backward...can shed light on what we, our children, and our grandchildren might have in store." 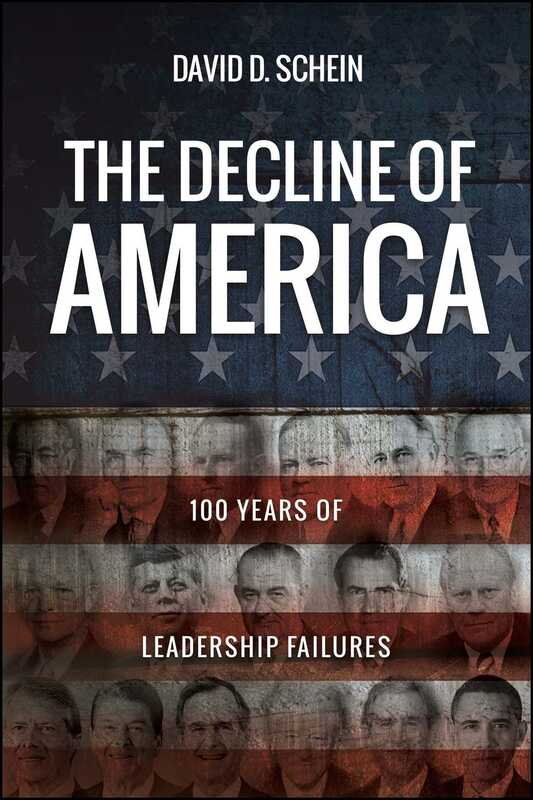 "I thoroughly enjoyed reading The Decline of America: 100 Years of Leadership Failures. Based on performances and not popularity polls, Dr. Schein has assigned a grade for each president that represents an overall evaluation on their ethics and leadership. The recommendations for correcting the problems in the U.S. are clear and insightful. This remarkable book will help the reader with a new view of the last 100 years of U.S. presidents." "The book gives a vivid picture of US presidents during the last 100 years and examines two important aspects of the presidents—their leadership decisions and their ethical orientation. The author is contributing to the field of research of the social, political, and economic systems around the world. Socially, the author has brought up the responsibility of presidency from the perspective of ethics and leadership. Politically, the author has brought out the failures of presidents from the angle of the US political system. Economically, the author has shown the municipal bankruptcies as a warning signal. I would recommend that my students in China read the book to broaden their vision of US society."